Harrison Ford told Jimmy Kimmel last week that Star Wars: The Force Awakens is "really, really good." He praised his young costars Daisy Ridley, John Boyega, Adam Driver and Oscar Isaac and added, "J.J. (Abrams) has made an incredible movie. You will not be disappointed at all. I promise you,"
On this week's ITMC, Anthony and I failed to mention that Ford was also wearing a hot dog costume at the time of the interview (it was Kimmel's Halloween show). I'm not sure why this is relevant, but it must have something to do with why we haven't seen Luke Skywalker in the movie poster or trailer. But, I digress. 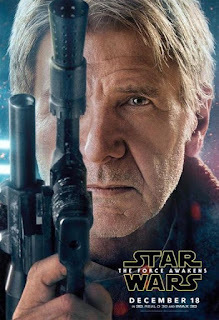 Harrison Ford likes The Force Awakens. That's all that matters. And on a side note, we're pretty sure the first trailer for Captain America: Civil War will screen in theaters prior to Star Wars. Like you needed another reason to hit the cinema on December 18. Asian actress Pom Klementieff is rumored to have joined the cast of James Gunn's Guardians of the Galaxy Vol. 2. At the time we recorded the show, we weren't sure what her role would be. Now we believe she'll play Mantis, who's kind of a badass telepathic martial artist in Marvel canon. If true, Mantis will be quite the match-up next to Gamora and her messed-up sister Nebula. 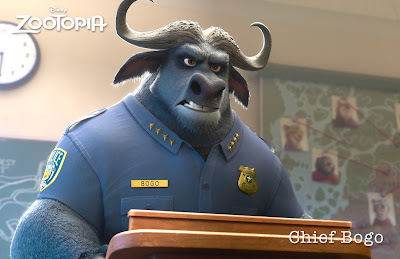 Idris Elba will voice Chief Bogo in Zootopia. Disney announced the principal voice cast for Zootopia. We already knew about Jason Bateman and Ginnifer Goodwin as the leads Nick Wilde and Judy Hopps. Now we know that Idris Elba, J.K. Simmons, Bonnie Hunt, Octavia Spencer, Alan Tudyk and Tommy Chong are also lending their talents to the Byron Howard/Rich Moore-directed film. And yet, despite that deep roster, we're still not excited about Zootopia, which opens on March 4, 2016. We're also not too excited about Alice Through the Looking Glass, the follow-up to Tim Burton's bloated, joyless--but immensely profitable--Alice in Wonderland. Brief video teases for the upcoming film, which opens next Memorial Day weekend, have been popping up online. Meh. 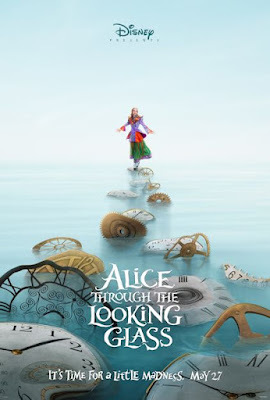 The one glimmer of hope that might make us care about the film is that it's being directed by James Bobin of The Muppets and Flight of the Conchords fame. Is Hocus Pocus 2 finally going to be a thing? Maybe. Maybe not. Producer David Kirschner has hinted that the long-rumored sequel to the 1993 comedy could eventually land on the Disney Channel. No word if Bette Midler, Sarah Jessica Parker and Kathy Najimy would be back as the Sanderson sisters, but all three have teased in the past that they'd be interested. 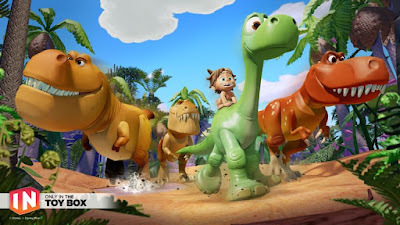 The Good Dinosaur in Disney Infinity. Disney Infinity is giving fans of Pixar's The Good Dinosaur a peek at some of the film's characters three week's before the movie opens. The caveboy Spot made his debut this week as a playable character in the video game. His dinosaur buddy Arlo and their three T-rex cohorts are also available as ride-able Power Disc characters. It's a good month to be a Disney collector with deep pockets. Auction house Bonhams and Van Eaton Galleries are both conducting auctions of rare (and yes, pretty expensive) Disney memorabilia. Don't worry, there's stuff you might be able to afford too. I'll have more about these two exciting events in this Friday's episode of The Mouse Castle Lounge. If you're Scarlett Johansson, you can visit Walt Disney World and ride the Twilight Zone Tower of Terror with your husband just like any normal person. You can also have your souvenir photo conveniently deleted much to the chagrin of your surprised ride buddies. Good thing there are persistent resort guests and TMZ to bring the pic to the light of day. It's actually a really cute photo.